Tucked away somewhere in this father-daughter heartwarmer is a story about Baby Singh, a lonely exploited pop singer played by Aishwarya Rai Bachchan whose manager (played with splendid sliminess by Girish Kukarni) suggests that she do some quick wardrobe malfunctions on the ramp to attrack attention. As if malfunction was a bonafide function on the religious calendar. Aishwarya, God bless her pristine soul, does what any decent girl would. She asks the slimeball to drop her off on the road. Huffing and puffing, she hops into a taxi being driven by none other than our ‘Fanney Khan’ a wannabe Mohd Rafi who wants to make his oversized daughter another Lata Mangeshkar. Cheers to that. The basic thought behind the film is clever and emotionally resplendent. But then why not the songs of the Nightingale instead of the absurd music that carpets the crisis. While Fanney grapples with the singing career of his under-talented, oversized, obnoxious daughter – the contempt that Pihu Sand puts in her voice and demeanour when talking to her naïve good-hearted father made me cringe. But then the failed Rafi a.k.a Fanney Khan decides to kidnap the singing diva Baby Singh with the help of a friend (Rajkummar Rao) who promptly begins falling in love with Baby Singh. The Baby and Baba (that’s Aishwarya- Rajkummar Rao) romance takes place in a rush of ransom resplendence. If you’ve seen the Belgian original Everybody’s Famous you’d know plausibility was never a prime consideration in the plot. The remake hovers uneasily between the precocious and authentic, drawing inspiration from the struggles of everyday life in a dream-driven chawl, but pinning to situations that are at once absurd and audacious. It helps that Anil Kapoor is a natural as a caring doting Dad, and that Divya Dutta, as his wife, looks every inch the middleclass Maharashtrian housewife and mother. Aishwarya Rai Bachchan is every bit the pampered diva who treats the besotted kidnapper (Rajkummar Rao) like her per poodle. All this would have qualified as satire on middleclass yearnings. But the joke on the Stockholm Syndrome would probably not work even in Denmark. What works is the film’s integrity, it’s intentions are fully bonafide. The daughter’s ridicule at a musical reality show has a ring of truth about it. So does the furious disdain the daughter shows towards her father. 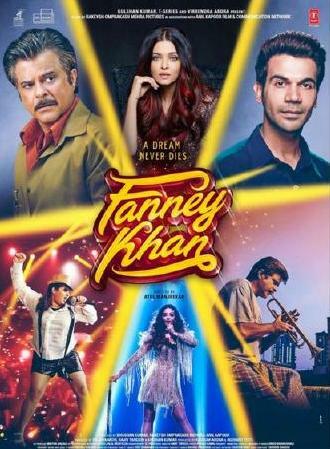 Eventually if you sit through the ordeal of watching Rajkummar Rao romance the stunning Ms. Rai Bachchan in an abandoned industrial factory with only her pet dog for company, Fanney Khan is a heartwarming ode to life, Lata Mangeshkar, Mohd Rafi and Shiela Ki Jawani. Effervescent and emotional it is an effective antidote to the pain of existence.